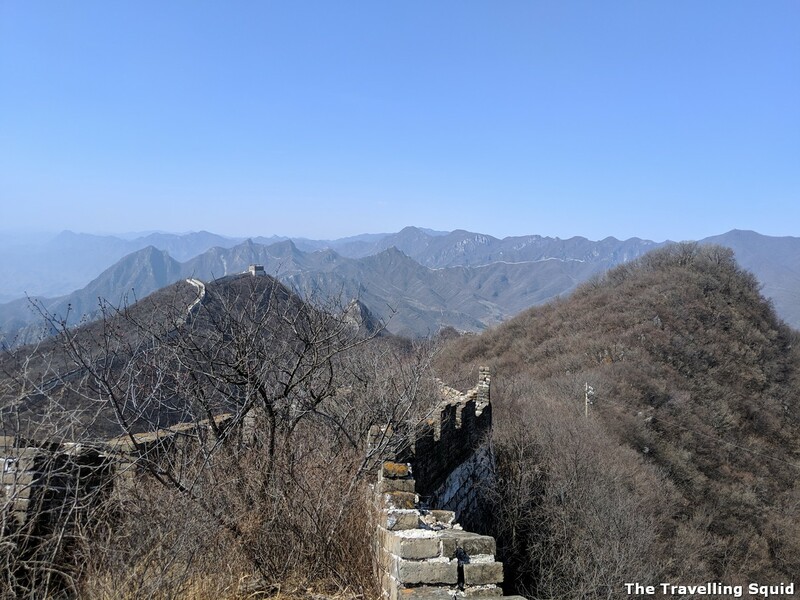 The Great Wall stretching across the horizon. 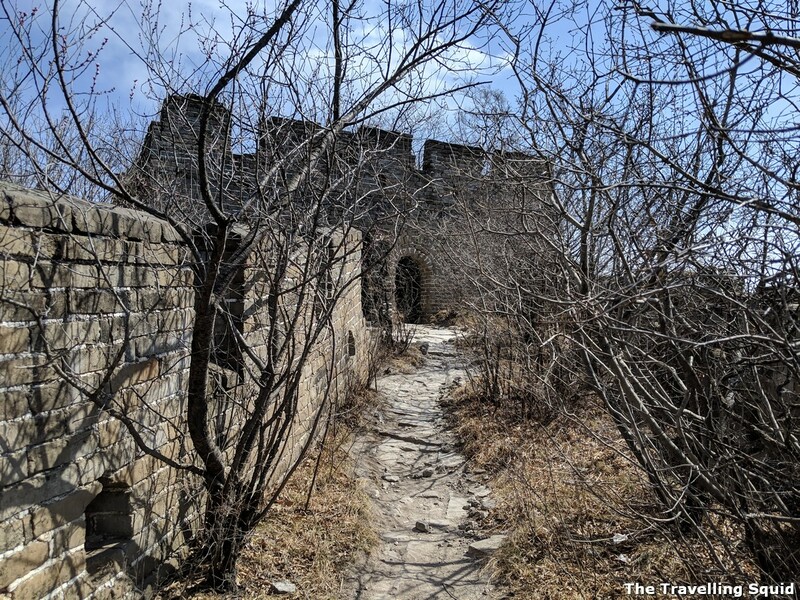 The crumbling walls – it’s charming on its own. 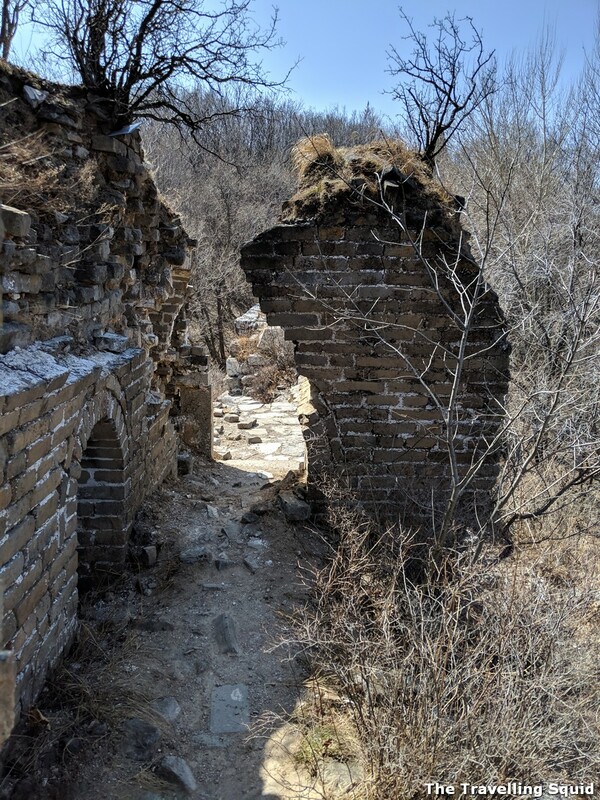 The path leading up to the Ox Horn section of the wall. 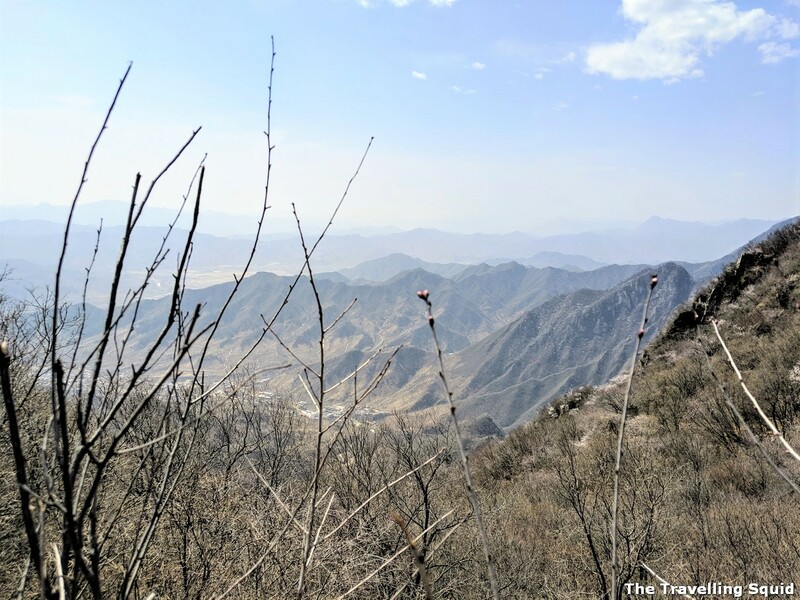 We carried on along the wild part of the Great Wall and approached the next key section of the hike – the Ox Horn. 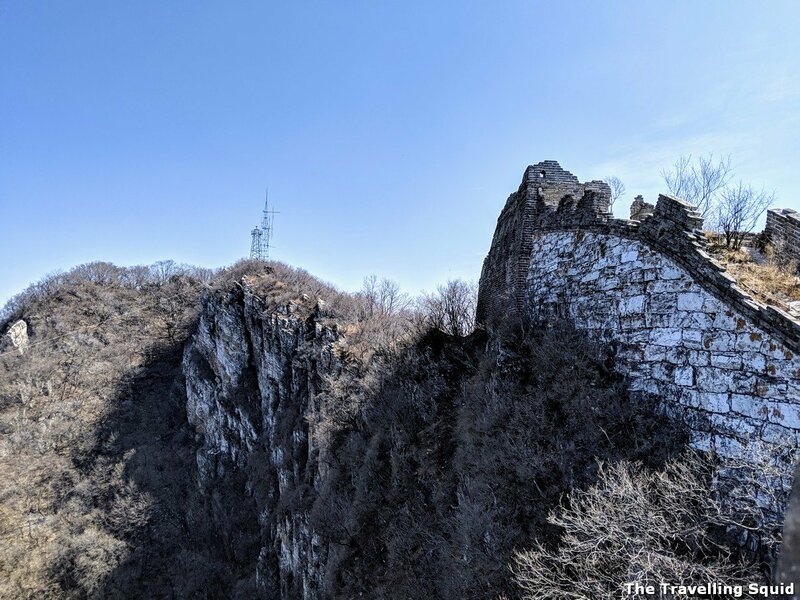 As the name suggest, this section of the wall is shaped like the horn of an ox. This section was challenging due to the steepness of the path and the fact that there were many loose stones and rocks along the way. My hiking boots were put to good use here. The steep slope up the Ox Horn. It looks steep but manageable. You can hold on to the shrubs and the wall for support. 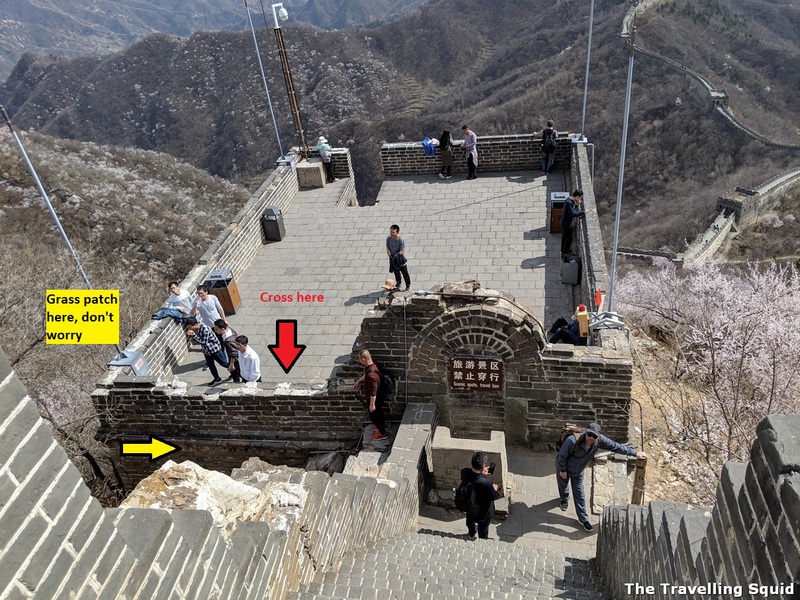 According to the map Zhang had shared with us (see second photo of this post), there is a short cut which allows you to skip this section of the wall, but I highly recommend heading up the Ox Horn, as it’s the highest point of the Jiankou – Mutianyu Great Wall hike. The view is worth it! 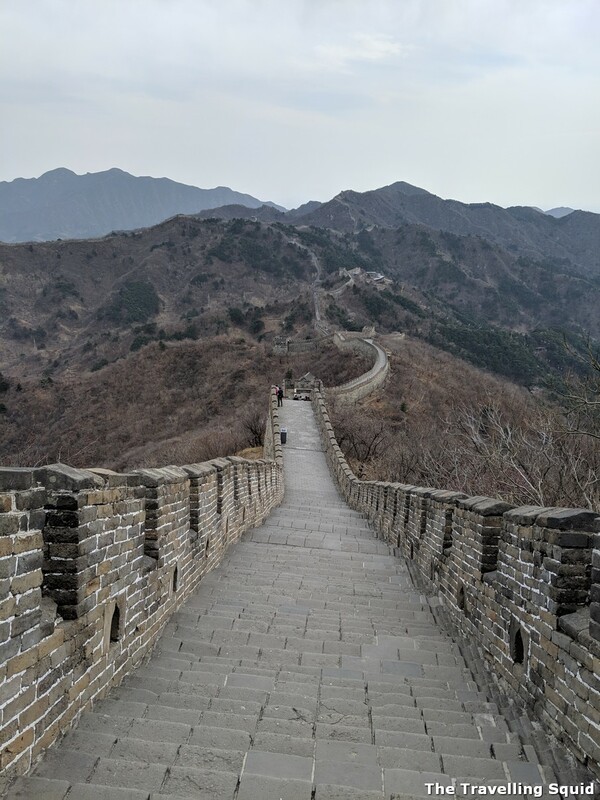 View of the Great Wall as we ascend the ‘Ox Horn’ section. 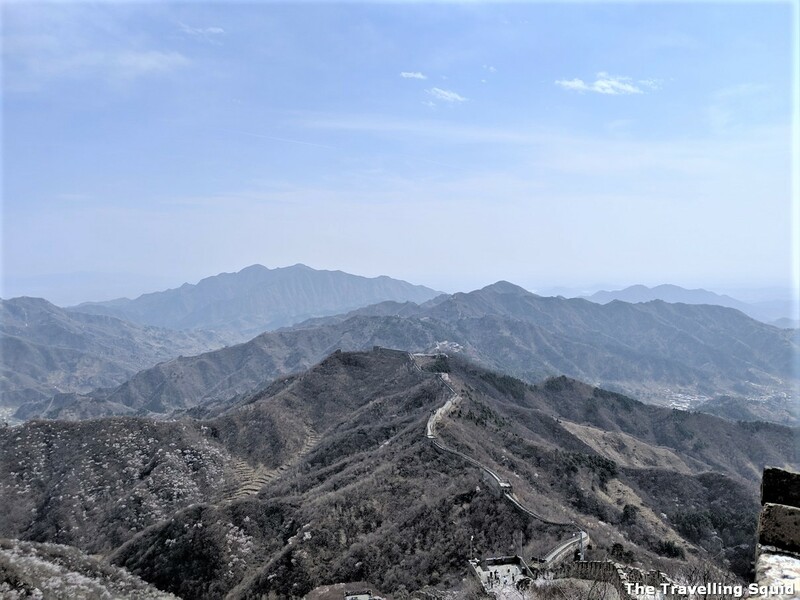 View from the highest point of the Great Wall. Going up the steep slope was a test of endurance, while heading down was a test of balance and strength. 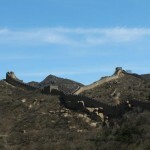 I was so glad that there were parts of the Wall still intact. When heading down, we descended as if we were climbing down a ladder. 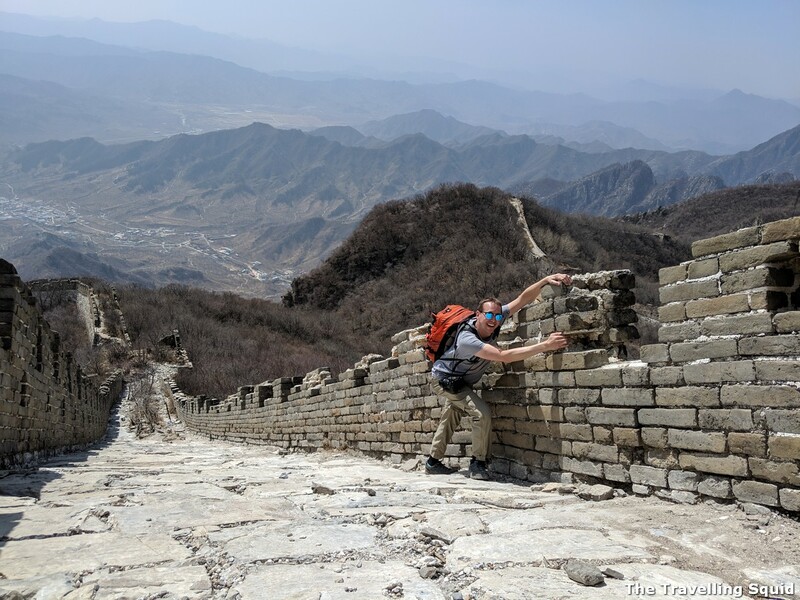 I recall clutching onto the remaining parts of the wall for support. The trick is that for every step you take, you got to make sure that the stones you’re stepping on are firmly rooted in the ground. Get a good balance first before taking the next step. 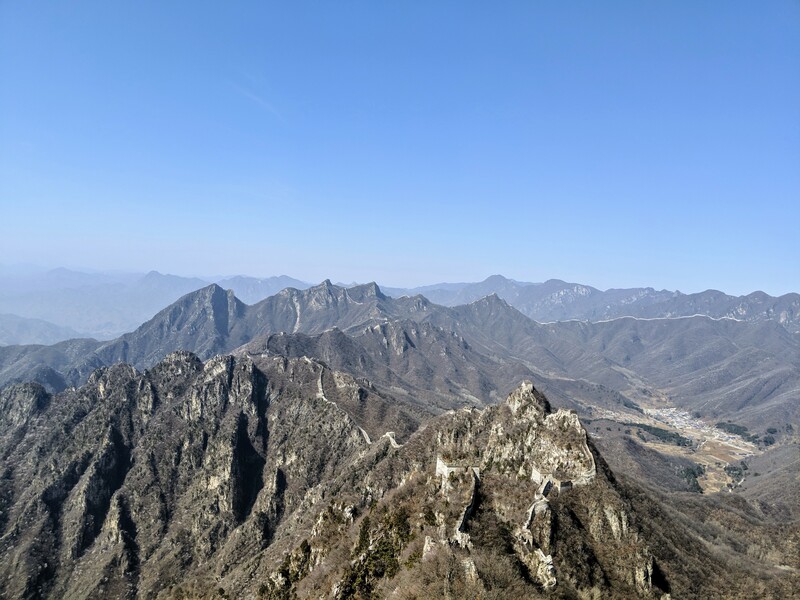 From the highest point of the Great Wall trek from Jiankou to Mutianyu. 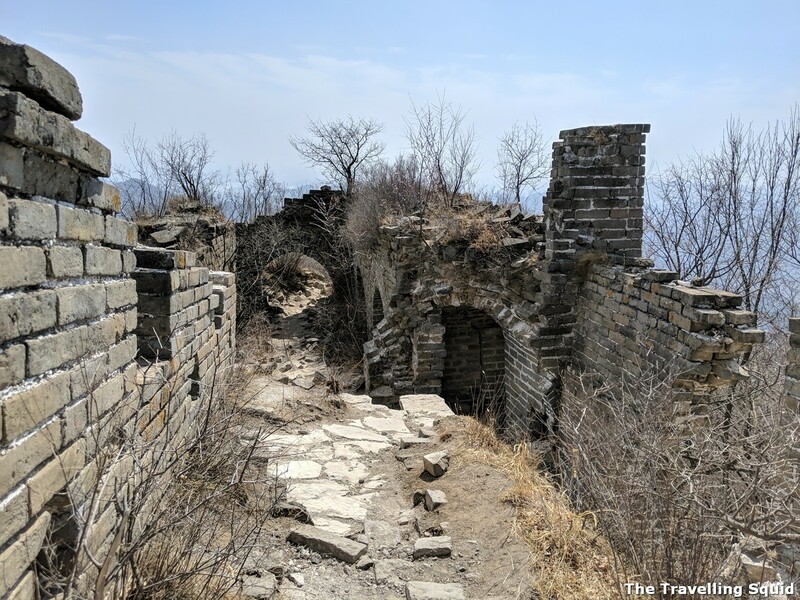 Descending from this steep path can be dangerous. Do take care. 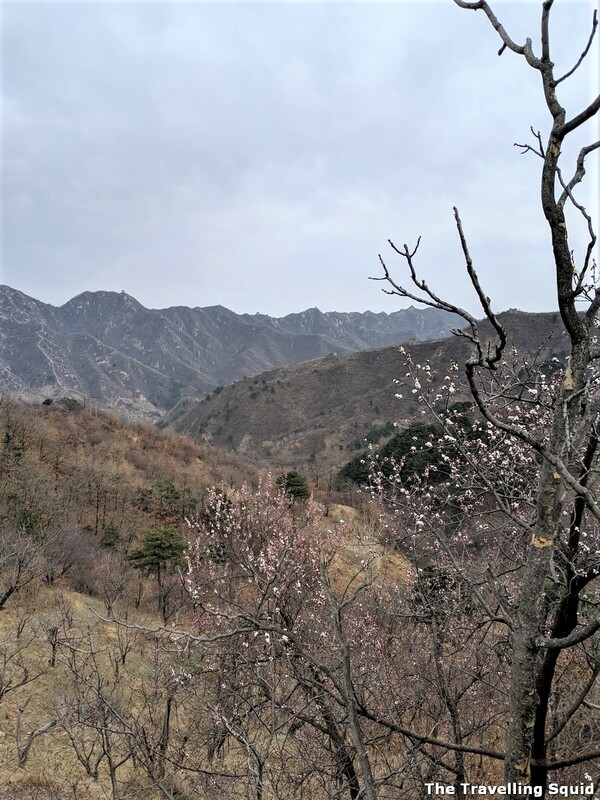 The path towards Mutianyu gets easier from there on, as seen from the photos below. This watchtower was significantly larger than the others. I took at least 10 of such photos during the trek. Like how I could see the path I had completed. Remembered feeling quite accomplished as we came from that watchtower high up on the hill. We arrived at a rest point where there were drinks for sale. J stopped by to purchase a beer. 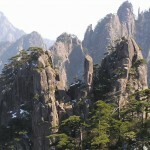 He said that in Germany, people would usually have a beer at the peak of a climb. 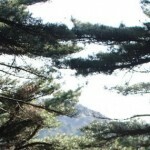 To me, this approach was highly motivating – definitely worth considering for my next hike. The path gets easier as we go along. At the barrier. It can be circumvented by climbing over the low ledge on the left. Don’t worry about falling. By the side of the low ledge is earth, as indicated by the yellow arrow. 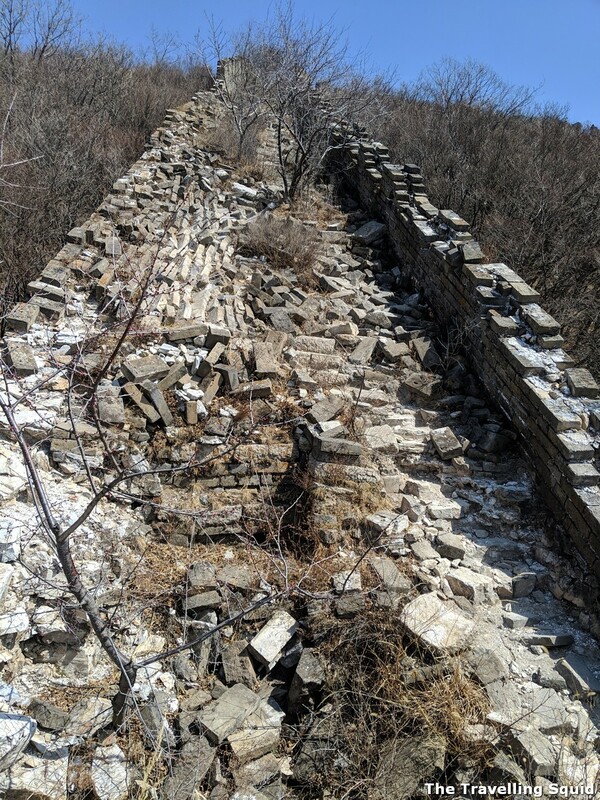 There’s a section of the wall which has been blocked (see picture). 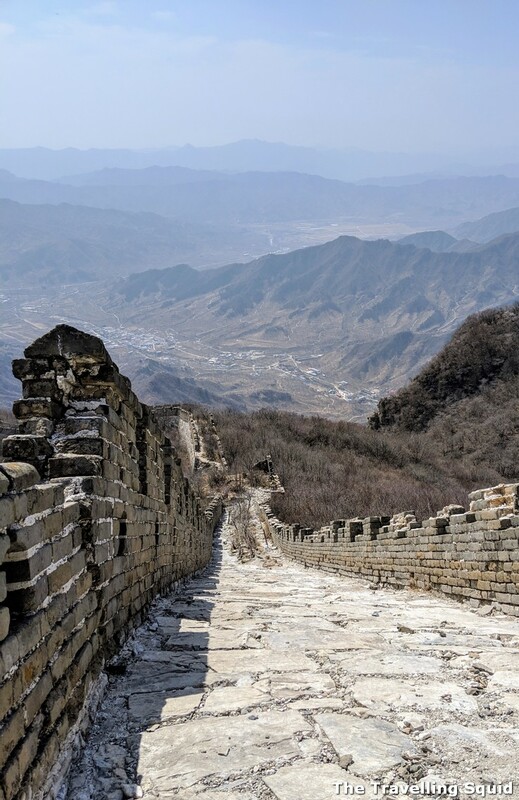 But fret not, you can easily get pass the barrier by climbing over a ledge. It’s not dangerous as there is space further from the ledge. How it looks like when we crossed the ledge. At the barrier, someone had set up a makeshift store. A longer path to get to the Toboggan. 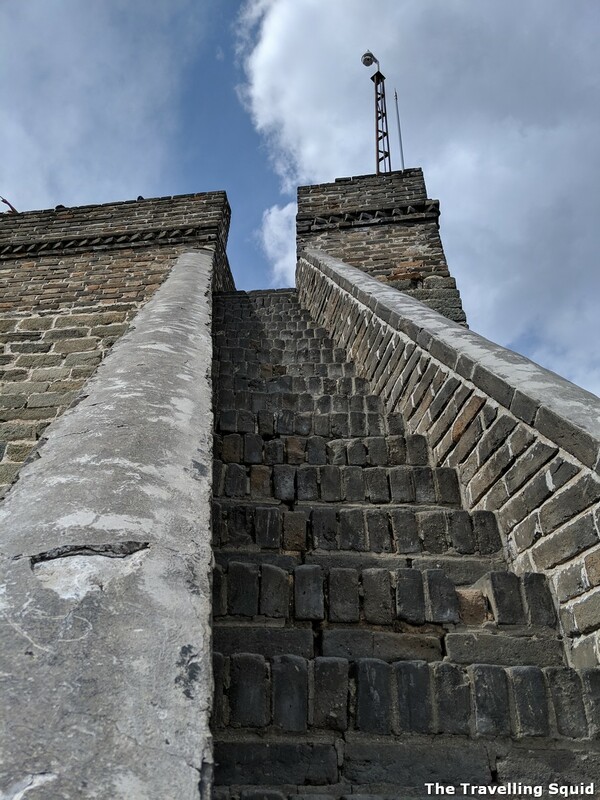 The Toboggan is located between Watchtower 6 and 5. The barrier is at Watchtower 20. For a short period of time, there were just a few people around. It gets quieter after Watchtower 14 (where the cable car is). Thought we arrived at the perfect time, with flowers blooming in the distance. That’s when we had to stop halfway. To wait for those below to complete their toboggan ride. 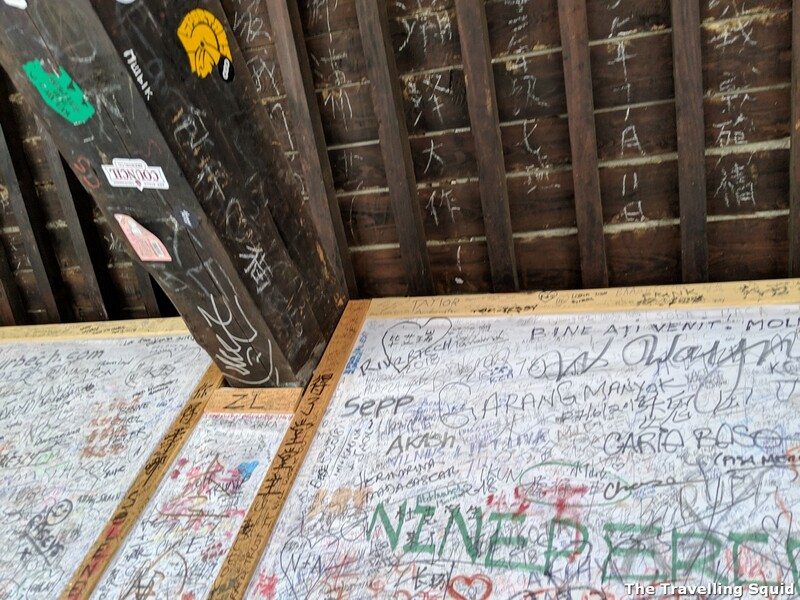 You have the option of taking a cable car down from Tower 14, or using the toboggan to slide down at Tower 6-5. We took the toboggan down and I highly recommend it! 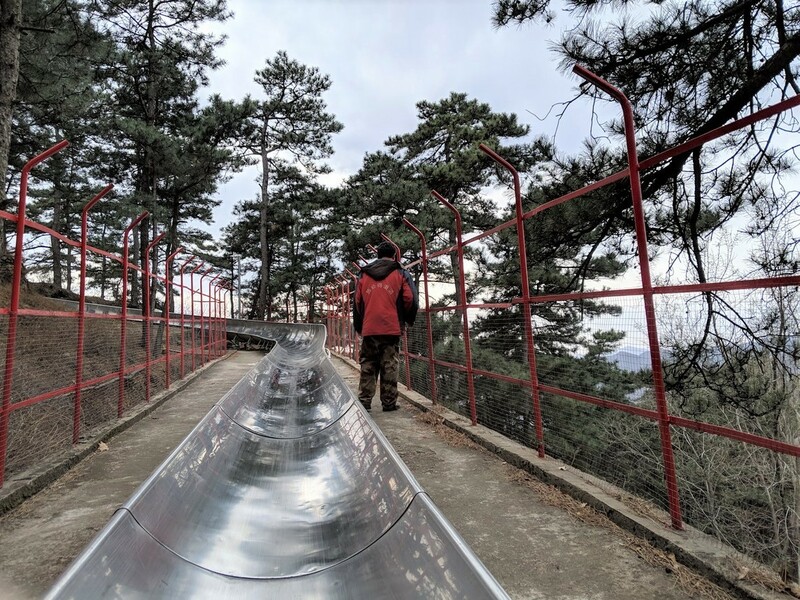 (Though the speed of the toboggan was somewhat limited by an elderly lady who was in front of us.) We also had to make an interim stop halfway through the ride as the lady was not going fast enough. But it was fun! 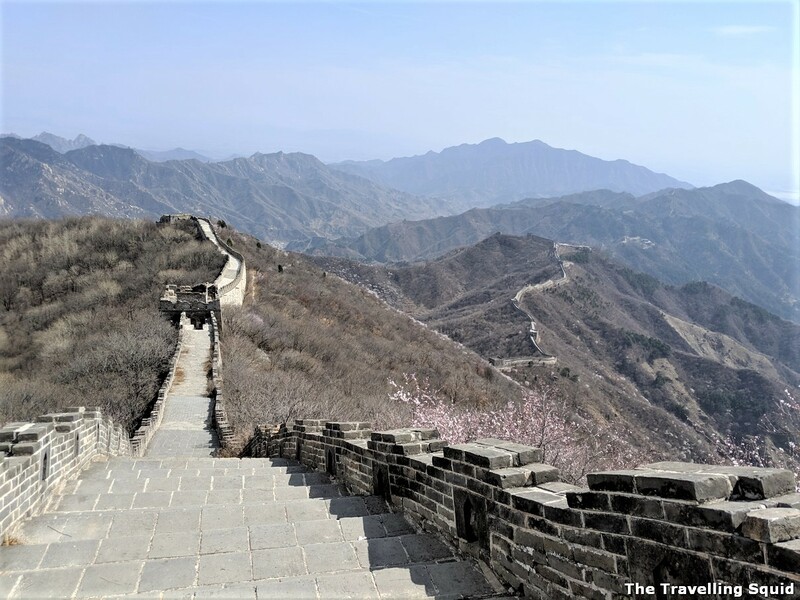 The feeling of sliding down the Great Wall is quite empowering. My legs were also quite sore from the hike earlier, so this was quite a relief. 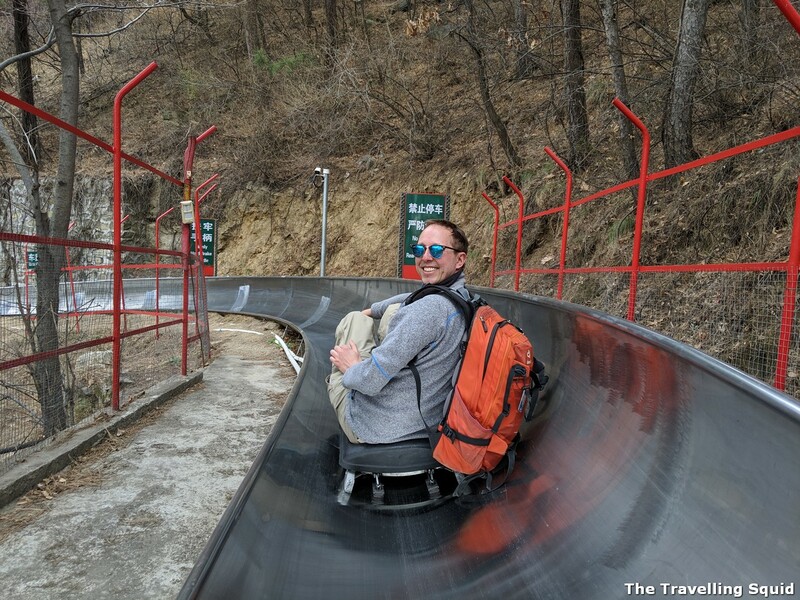 It cost RMB100 for the toboggan ticket and RMB80 for a one-way cable car ticket. Note: There are toilets available at the cable car station at Watchtower 14. 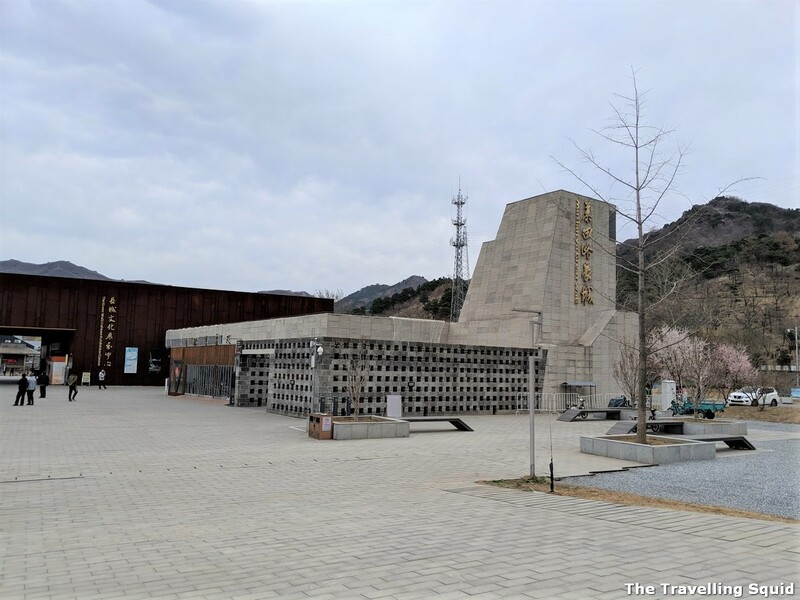 The visitor centre at Mutianyu. 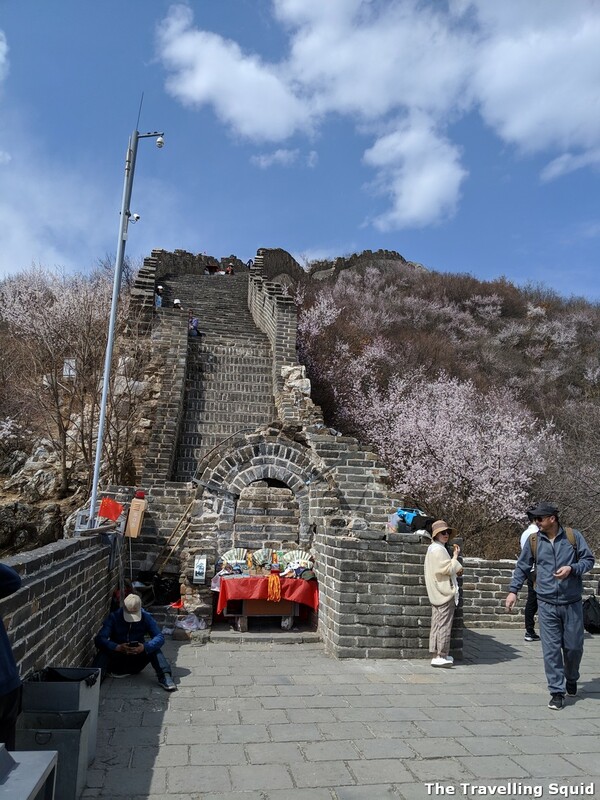 That’s where we met Zhang – his van is parked nearby. 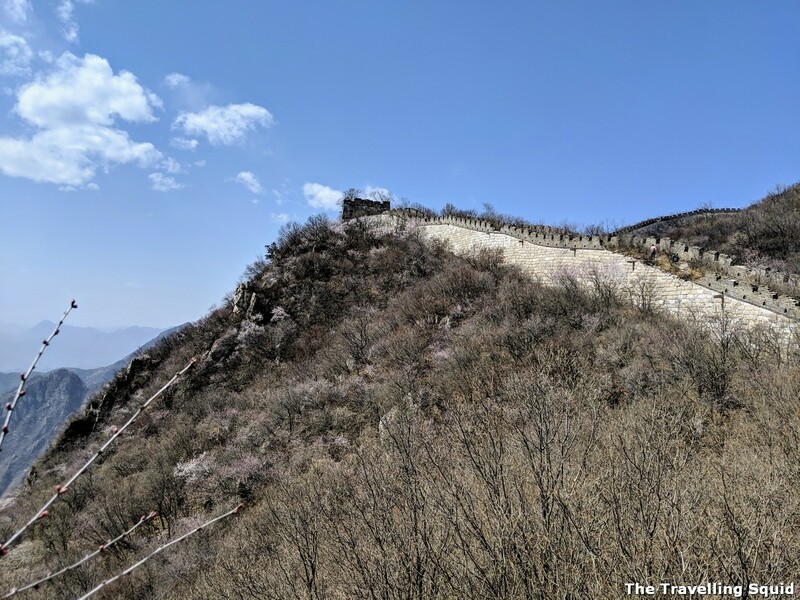 Vehicles are not allowed at the foot of the Great Wall at Mutianyu, so you will need to take a shuttle bus down to the visitor centre. 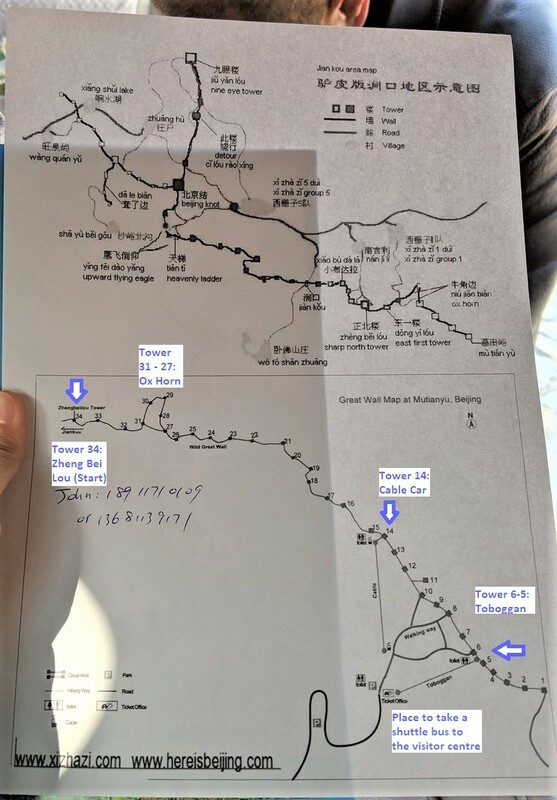 That is where Zhang had parked his van and we concluded our hike. The shuttle bus ticket cost us RMB10 and the bus service is regular. You have the option of walking down too, but my legs were not having any of that. Beer as the final reward. 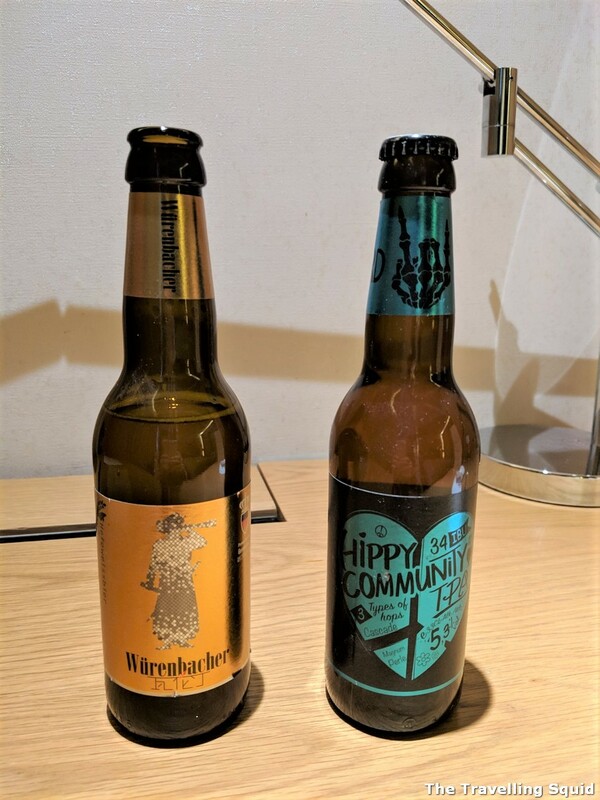 Would have been better drinking it at the highest point, but having these in hotel was fine too. 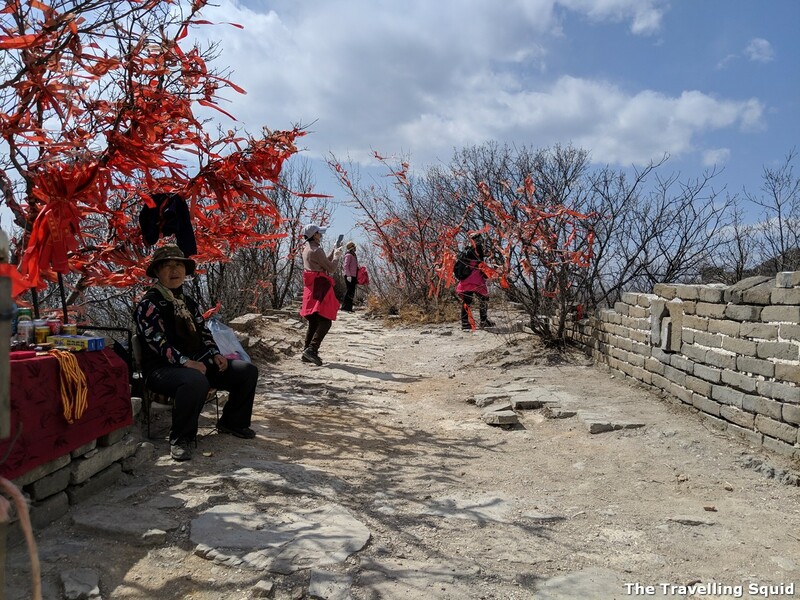 I thought that the six hour Great Wall hike from Jiankou to Mutianyu was a good balance. The tougher part was at the start when we ascended. After the Ox Horn, the rest of the walk was manageable as we were descending. 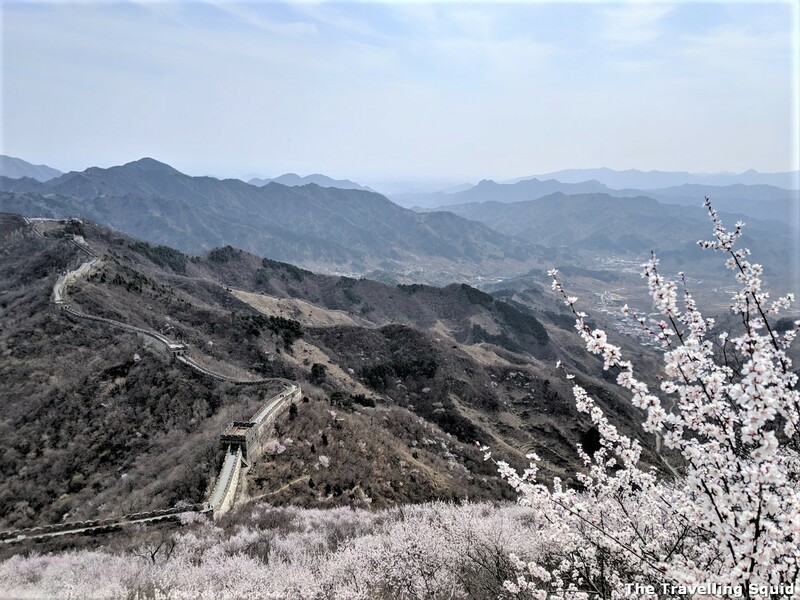 Zhang also said the it was better for the hike to be from Jiankou to Mutianyu and not the other way round as there are more up slopes for the latter. I do encourage you to stop and enjoy the scenery at each part of the hike, especially at the wild parts. 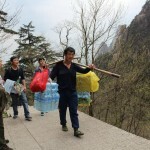 There isn’t a need to rush – we completed the hike in about 6 hours. Zhang wasn’t too particular about time we took. We were to meet him at 3.30pm, but arrived at the visitor centre at about 3.45pm. To be honest, I was worried about doing this hike alone. 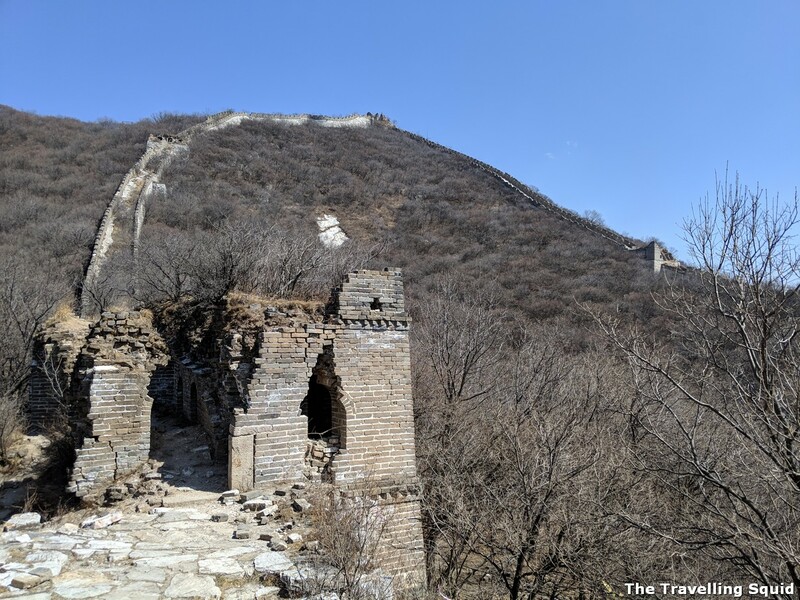 I was concerned about losing my way, and not being able locate the Great Wall from the Xizhazi village. Or falling down and getting injured with no one to help me. It’s strange because I don’t recall being so cautious back in my early twenties, when I used to travel in India alone. Hence, I was very grateful to have J as a coincidental travelling companion. 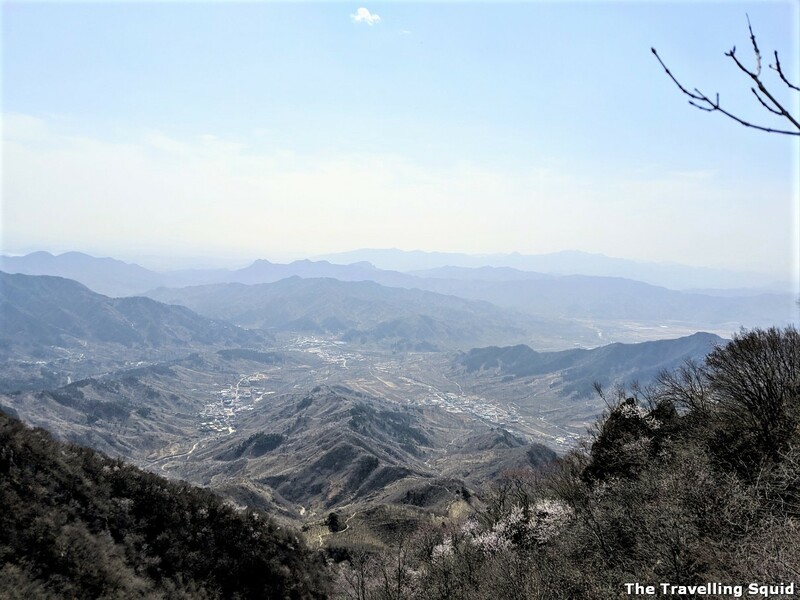 The hike is challenging at the earlier stages, but as you can see from the photos, it gets better as you go along. 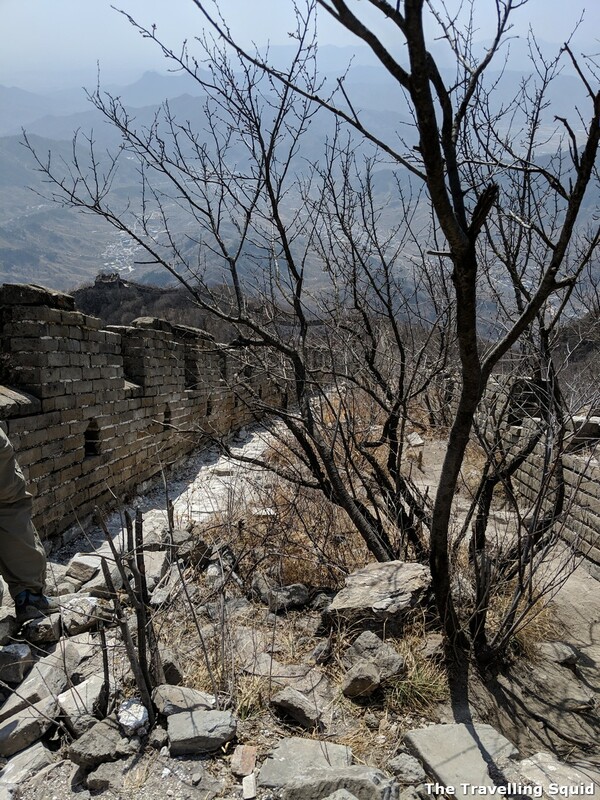 My take is that it is worth attempting even if you’re alone, as there are people hiking along the Jiankou part of the Great Wall, just not many. 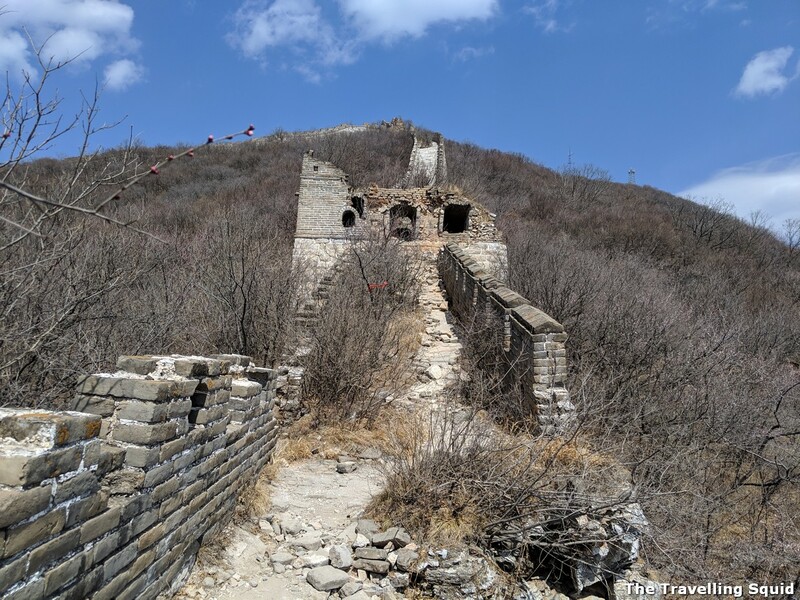 I am not sure how long will the wild part of the Great Wall remain. It could change due to redevelopment plans. But for as long as possible, I hope its raw and rustic charm endures. 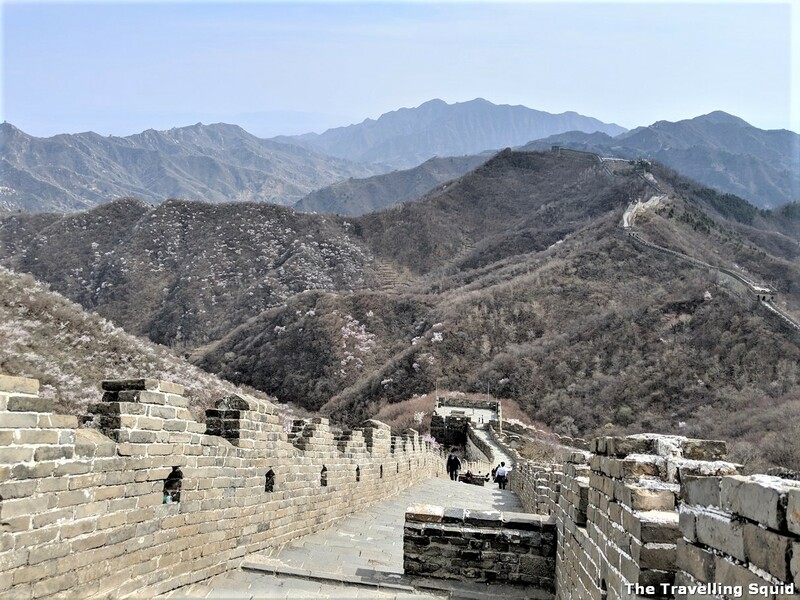 As I gripped the Wall for support while covering the steeper slopes, I can’t help but wonder about the people who built the Great Wall centuries ago, with simpler tools and in much harsher conditions. Perhaps, it’s a symbol of the accomplishments of human endeavor, to be appreciated and preserved by many generations to come. Please don’t litter when you are there. Note: The trip was paid for by The Travelling Squid. 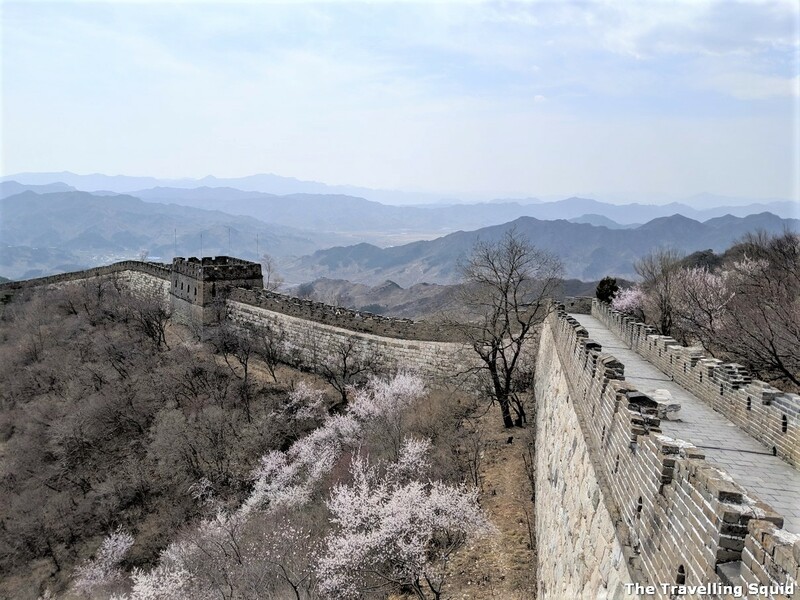 Should you be keen to do the six hour Great Wall hike from Jiankou to Mutianyu, Zhang from Here is Beijing can be contacted at: bjbdt@qq.com , or best, through WeChat at (0086) 15652318283. 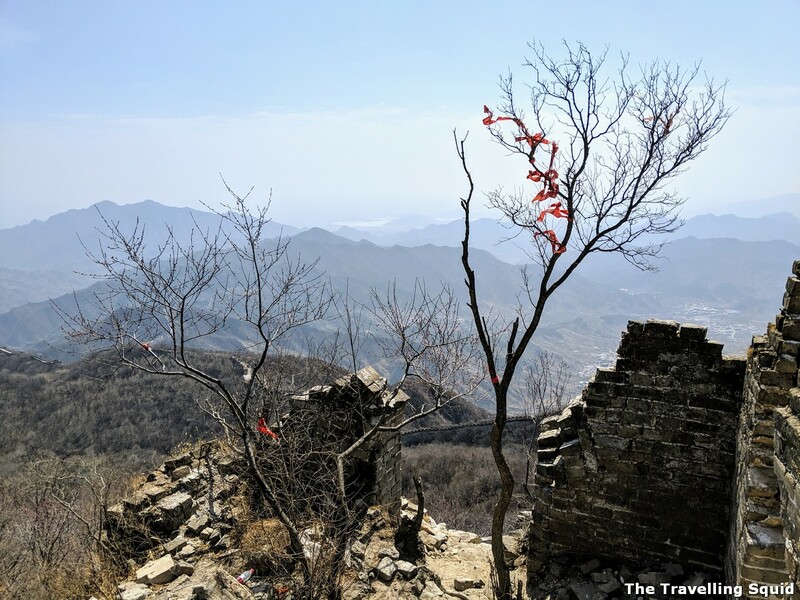 If the six hour hike is too long for you, you could also consider a hike at Jinshanling. It should take about 3 hours. 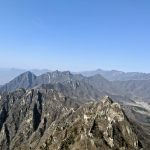 One Response to "Part 2: The six hour Great Wall hike from Jiankou to Mutianyu"